The acronym HVAC stands for “heating, ventilation, and air conditioning”—three things that are typical of the modern conveniences enjoyed in just about every home today. While it is a great comfort to be able to control your home’s temperature at the turn of a knob or the touch of a button, maintaining your HVAC system is also quite expensive because of its energy consumption. Make a mold removal solution. Take about a tablespoon of detergent and combine it with a cup of water and half a cup of baking soda. Put on some protective rubber gloves and a face mask. This is to protect your skin and nose from the harsh chemicals and their accompanying fumes. It also prevents your skin from coming into contact with any mold spores and other harmful elements. 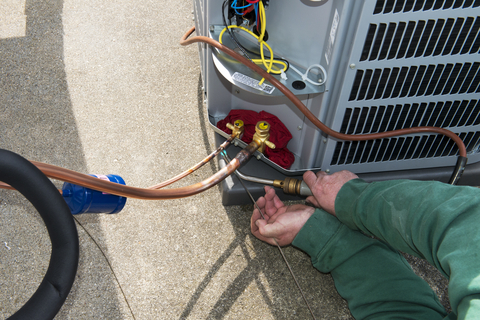 Shut down your HVAC system so you can access the interior components safely. This also prevents the spread of any harmful fumes or mold spores through the ventilation system during the cleaning process. Apply some of the cleaning solution onto a wet rag and use the latter to spread the solution onto the surface of your HVAC system’s interiors. Let it sit for a few minutes, and then scrub it in circular motions using the rag to get rid of the mold. If there is any excess solution left, use some paper towels to get rid of them and run a vacuum along the area to absorb any remaining fumes. Repeat as needed. Dab some commercial mold inhibitors on the HVAC system’s interiors and dispose of the cleaning rags properly by double-bagging them in some thick trash bags. Ask around for referrals. Your family and friends might hire a company or a specialist from time to time to clean their HVAC systems, so you can ask them for recommendations. Check the local phone book. Most registered and licensed HVAC contractors are listed in the local phone book, so rifling through it is a great way to find a few service providers in your area. Go online. 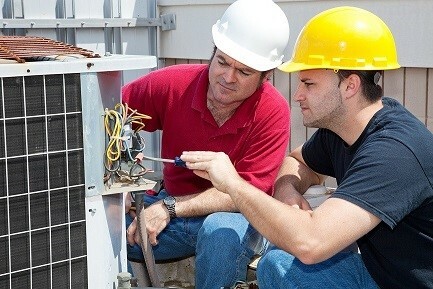 Lots of HVAC contractors and specialists also maintain company websites that you can access online. Type in “HVAC contractors” or “HVAC specialists” into your favorite search engine and check out the sites that appear. These websites usually feature a brief company background, contact information, the company’s mission-vision, and a list of services that they offer. You can also try asking for a direct quote for cleaning or maintenance on the websites by filling in the appropriate details on the allotted page.